Biscotti (Italian, for “twice-baked) are Italian cookies that are baked as logs on a cookie sheet. 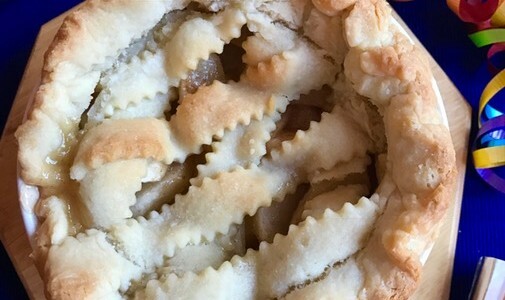 After cooling, they are cut and baked once more – this makes them dry and crunchy. 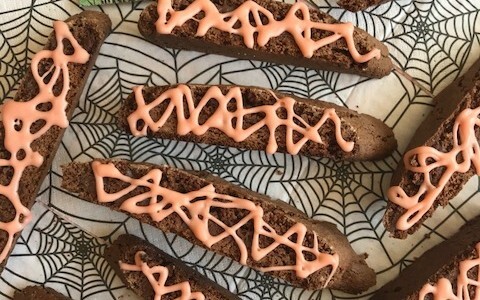 Make these Spider-Web Biscotti by frosting them with swirly lines. Kids of all ages will love’em. Happy Halloween! 2. Line one 18 X 12 baking sheet with parchment paper. Alternatively, butter the baking sheet, add 1 tablespoon flour; shake off excess flour and set aside. 3. In a small bowl, combine the flour, cocoa powder, baking powder, cinnamon and salt; set aside. 4. In a large mixing bowl or the bowl of a stand mixer, beat the butter and sugar until light and fluffy. 5. Beat in the eggs and vanilla extract; stir in the almonds and chocolate chips. 6. Gradually (a little at a time) beat in the flour mixture until all ingredients are amalgamated or uniform. 7. Shape dough into one ball. Divide the ball in two smaller balls. 8. On a lightly-floured surface, gently roll out one ball until it forms a log, measuring 14 inches long by 1-3/4 inches wide. 9. Gently lift and place the log on the baking sheet – about 1 inch from the long edge (this ensures that there is room for the next log). 10. Repeat rolling instructions for the remaining log and place it about 3 inches away from the first log. 1. Place the baking sheet on a rack positioned in center of oven. 2. Bake the cookie logs for 25 to 30 minutes or until they spring to the touch. 3. When cookie logs have baked, transfer the cookie sheets to a rack or a counter. 4. Leave cookie logs on sheets to cool for 5 minutes. 1. After 5 minutes, gently transfer one cookie log on a cutting board. 2. Using a serrated knife, cut DOWN into the log in this manner: You will cut 3/4-inch wide biscotti by positioning the point of the knife at top edge of the log. 3. In one motion, bring the knife down and cut through the log. 3. Cut the remaining biscotti into 3/4-wide slices. 4. Carefully place the biscotti, cut-side down on the baking sheet. 5. Bake 5 minutes per side. Remove baking sheet from oven and set aside on a counter – let biscotti cool completely. 1. In a 3-cup mixing bowl, combine the powdered sugar with the water. If the mixture is too dry, add about 1/2 teaspoon more water. It should not be too runny nor too hard. 2. Add the food color – you may need to adjust the tone by adding 1 more drop yellow or red food color. 3. Transfer the orange frosting to a pastry bag fitted with a narrow tip. 4. Lay out the cooled biscotti on a baking sheet and drizzle the frosting over each one, creating a web-like pattern. 5. Serve biscotti immediately or store them in a tightly covered container in refrigerator up to 2 weeks. The word “green” has a healthy connotation these days. If we’re eating “green”, then it can be assumed that your intake of foods consists mostly of fresh fruits and vegetables. 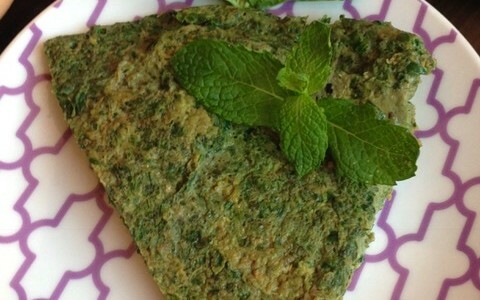 Here’s a recipe for a green omelet. The eggs turn green when you add finely-chopped spinach or chard. Add parsley, Parmigiano Reggiano cheese and serve the omelet at your Easter Brunch! Happy Easter! 1. In a salad spinner, combine the mint, spinach (and/or chard) and parsley leaves. 2. Wash, drain and spin dry the leaves – finely chop all leaves. 3. After leaves are finely-chopped, set them aside in a 3-quart mixing bowl. 4. In another 3 to 4-quart mixing bowl, combine the eggs, salt, black pepper and grated cheese. 5. Using a fork or a wire whisk, beat the egg mixture. 6. When egg mixture is uniform, stir in the chopped leaves to combine. 7. Heat oil in a 12-inch nonstick skillet; when oil is hot but does not smoke, pour the egg and leaf mixture into skillet. 8. On high setting, check that the edges of the omelet begin to curdle; immediately set heat on medium-low and cover the skillet. 9. Every so often, using a spatula, lift sides of omelet and title skillet so that the raw egg escapes to bottom of skillet. 10. Cover the omelet and cook for about 5 to 7 minutes. 11. When omelet top has set, using the spatula, cut it into fourths. 12. Gently flip each omelet fourth over and cook on low heat for about 4 to 5 minutes. 13. Check underside of omelet. If it looks golden-green, the omelet is ready to be served. 14. Transfer omelet to a serving platter. Cut omelet to yield 10 to 12 pieces. Serve as part of a breakfast menu or at lunch with a green salad. Need a great starter to go with the bubbly at Christmastime? Assemble these stuffed mushrooms a few hours ahead and refrigerate them. At serving time, preheat the oven and bake them. Made with all-vegetarian ingredients, the mushrooms will be devoured in no time. Enjoy and Merry Christmas! 1. Remove stems from mushroom caps; finely chop the stems and set aside in a small bowl. 2. In a 10 or 12-inch skillet, heat the oil on high. 3. As soon as the oil is hot (it should not smoke), lower it to medium-high and stir in the chopped mushroom stems. 4. Using a wooden spoon or cooking spatula, stir-fry the chopped mushroom stems on medium-high heat for about 2 minutes. 5. After 2 minutes, add the chopped onion and stir-fry for an additional 2 minutes or until onion is translucent. 6. Transfer the mushroom-onion mixture to a bowl – set aside to cool for a few minutes. 7. 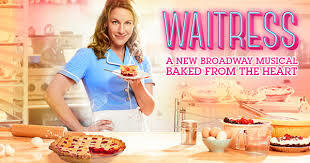 Meanwhile, preheat the oven to 400°F. 8. Take 3 bread slices and quickly pass them under cold water; squeeze the excess water out of bread slices. 9. Discard the crusts and crumble the softened bread into a 2-cup bowl. 10. Add the beaten egg, grated cheese, minced mint leaves, salt and black pepper; stir to combine. 11. Stir in the mushroom-onion mixture. If mixture is too wet and does not amalgamate, soak the remaining bread slice (discard crusts) and crumble it into the mushroom stuffing. 12. Taste stuffing for salt level. If needed, add a tiny amount of salt. 13. Divide the stuffing onto the inverted mushroom caps. 1. Oil a baking sheet and place the stuffed mushrooms (stuffing side up) on it. 2. Set the baking sheet with stuffed mushrooms on a rack positioned in center of oven. 3. Bake the mushrooms for 15 minutes. 4. After 15 minutes, check to see if stuffed mushrooms have turned light golden brown. If not, bake them for an additional 2 minutes. Serve stuffed mushrooms hot.